Actually, it kinda feels like late spring. It's currently 78 degrees. Stinky is hanging out around a few plants we picked up this weekend that are in limbo at the moment. We're going to make mahi mahi tacos for dinner tonight and dine al fresco, finally able to use our patio furniture for the first time. Who knew you could find such a perfect day on a Tuesday? Stinky looks so regal in that photo. 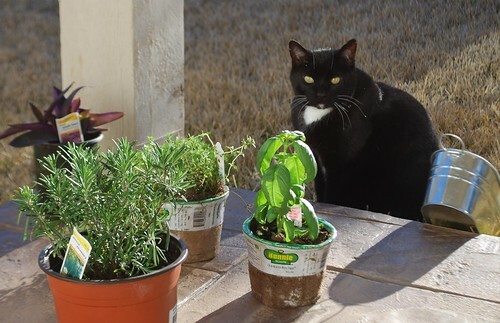 Like he's thinking about what to do with the basil plant. Perhaps make a little cat pesto.